Donald Paul Busteed was arrested in connection with several pipe bomb incidents in Anaheim, according to police. ANAHEIM, Calif. (KABC) -- A man connected with several pipe bomb incidents in Anaheim was arrested Monday evening, according to officials. 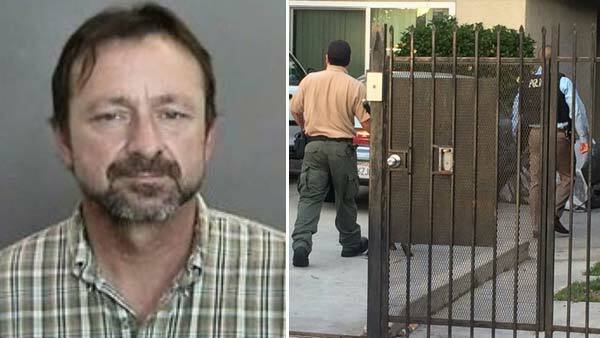 Anaheim police said Donald Busteed was arrested in connection with three pipe bombs discovered in the area over a two-month period. The first incident occurred on Nov. 13, 2015, in the Lowe's Home Improvement parking lot located at 1500 North Lemon Street. A shopper discovered an explosive device in the parking lot and a bomb squad from the Orange County Sheriff's Department responded and detonated it. On Dec. 11, 2015, a bystander spotted a pipe bomb at the base of a utility pole in an alley in the 300 block of South Claudina Street. A bomb squad responded and detonated the device. An explosive device was then detonated at a business in the 2800 block of East White Star Avenue on Dec. 31, 2015. Investigators said they responded to the store on Jan. 4 to collect evidence from the scene and Busteed, an employee at the business, admitted to detonating the device. Busteed was arrested for possession of an explosive device and was booked at the Orange County Jail on $1 million bail. Busteed's garage was searched and officials said items used to manufacture explosive devices were discovered. He pleaded guilty to the East White Star Avenue incident and was sentenced to jail. But Busteed was later released in mid-January and placed on probation, according to police. Investigators said they were trying to determine whether Busteed was connected with the North Lemon Street and South Claudina Street incidents. After further investigation and forensic testing, detectives said it's believed Busteed is responsible for the placement of all three explosive devices. Busteed was placed under arrest at his work in Fountain Valley late Monday afternoon and officials searched his home for additional evidence. Officials said they were now attempting to find a link between Busteed and a pipe bomb that exploded outside a business in an alley in the 600 block of North Anaheim Boulevard on Sunday. The explosion caused minor damage to a concrete wall and utility pole. No injuries were reported. On Monday, Busteed was booked for possession of explosive devices and probation violations. No bail was set.